Possibly no other African rulers maintained such a rich variety of musical ensembles at their courts as the Kabakas (kings) of Buganda. For several centuries their kingdom was the largest and most powerful state in central Africa and their palaces resounded throughout each day with music. Here is a unique sample of this musical richness, featuring the two different xylophone ensembles, the royal flute band, the songs of the king’s harpist and lyre players, as well as praise drumming and dancing. In 1966 the kingdom was suppressed by Prime Minister Obote and King Mutesa died in exile. 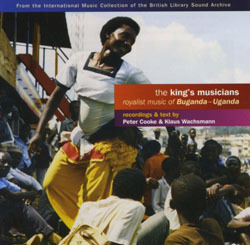 Though some of the old musicians gave an ecstatic musical welcome to his son, Mutebi on his return in 1987 (also recorded here), some of this music may soon become little more than dim memory.